First glimpse of the now unclassified Mail-Box-Cam. 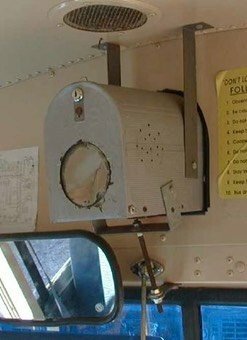 Yes, this is the only school bus video system that incorporates a box that is approved by the U.S. Postmaster General. Amazing as it seems this system was likely advertised as the high-tech system of the past. The only system that I believe has made more of an impression on me than this Mail-box system was the rare "Barney-Lunch-box-Cam." To date I have seen only one and missed the opportunity to get a photo of it. It was a child lunch box with a hole cut out for the lens and suction cups on the back to hold it to the bulkhead of the bus.